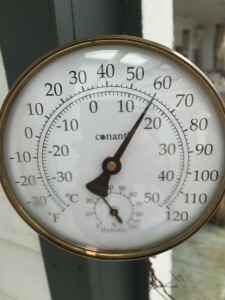 No, you’re not seeing things… my thermometer, on a fairly overcast February 25th, reads 60 degrees! If we feel confused by the record high temperatures this winter, just imagine how our gardens are feeling. Although I’m thrilled that my heating bill has been super low, I hate to think I’ll be paying for it with the loss of some of my favorite plants in the landscape. With the mercury creeping toward 60 degrees today here in the Lakes Region of New Hampshire, you may actually see some spring bulbs beginning to poke their heads through the soil. Don’t panic, they should be fine even if Mother Nature drops another deep freeze on us. The foliage that emerges first is fairly hardy and can handle the cold temperatures while the flower buds remain protected underground. We may however, lose plants to this freeze, thaw, refreeze pattern that we’ve been having lately, and the lack of snow cover doesn’t help at all. On one of these mild days take a stroll around your garden and check things out. If you notice any perennials beginning to push out new growth at this early date you can cover them with mulch or branches – a great use for the old Christmas tree! Check perennials and roses for signs of heaving when the weather is this warm. Gently press the crowns back into the ground and add a light mulch if possible. Be sure to uncover the plants when the temperature gets consistently warm to discourage the growth of mildew and fungus… you know… in the spring! Native trees and shrubs usually survive these periods of extremely warm weather very well. 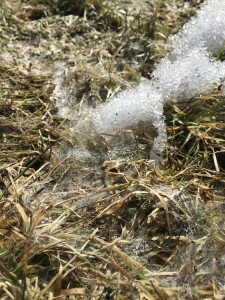 If the dormancy requirements of the plants have been met then the warm weather may cause buds to swell or even flower. These could be damaged by another cold spell, which is certainly possible being that we haven’t yet turned the calendar on March! Nice Winter We’re Having This Spring! Here comes the snow, here comes the plow truck, here comes the sander… there goes the lawn. Very shortly here in the beautiful Lakes R egion of NH, the snow will be gone, (fingers crossed behind my back). That lush green lawn you tended so lovingly last year has most likely taken a beating under this long lasting carpet of white. The longer, sunny days ahead will reawaken your lawn – The part that’s not still buried that is. Piles from plowing and shoveling cover parts of the lawn adding weeks to the time that grass has access to sunlight. 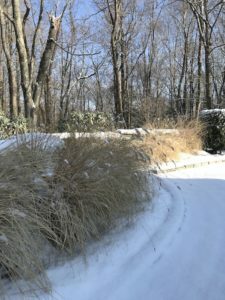 You can help this process along by breaking up large piles and removing snow from the edge of driveways and walkways and placing it on the drive or walk where it will melt faster. This will expose the grass to the sun and allow it to start warming the soil. Removing the sand and gravel deposited by the plow allows for air circulation around the grass and stimulates plant healing. This is most easily done with a rake and/or a backpack blower. Adding a starter fertilizer and some “organic amendments” like good compost, or peat will give your grass a much-needed boost. 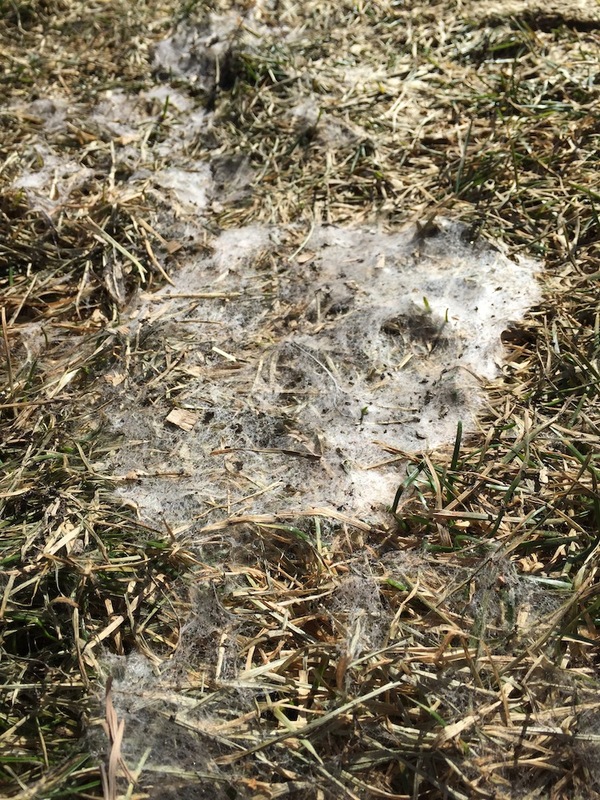 As the snow melts away you may start to see unusual pink or whitish-grey web-like spots on the grass. 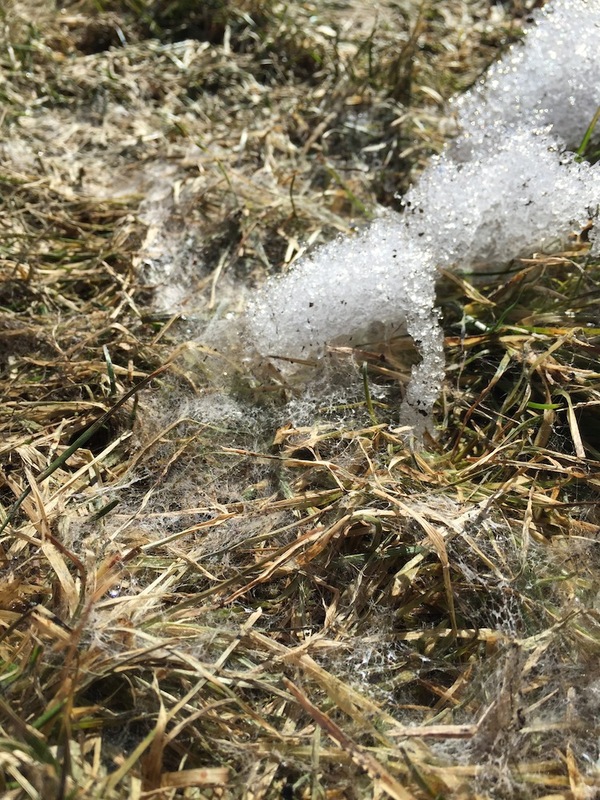 This creeping crud, better known as snow mold, can cause some damage if the area stays wet and you don’t remove it. The disease is generally only affecting the grass blade at this point. A good spring fertilizer will help push new growth and your lawn will “outgrow” the disease. Gently rake the patches away once the grass is dry and dispose of the debris in the trash NOT in your compost pile. Give your rake a rinse as well to prevent spreading the spores around. If damage is very visible you can apply compost or fertilizer and a little seed as well. 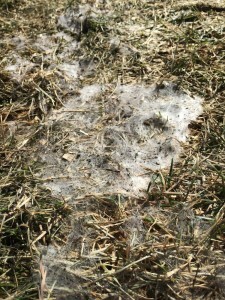 The good news is that snow mold fungus, for the most part, is a cosmetic issue. Call the professional Lawn Enforcement Officers at Miracle Farms to help take care of your post-winter lawn care woes. I love winter. And I love snow, lots of snow. Not so lucky thus far this winter in that department, unfortunately. It’s certainly a little more challenging to enjoy a practically snowless winter. Sure you can still enjoy hot cocoa, warm soups and stews and a cozy fire, but it’s so much nicer to look outside and see that beautiful blanket of white everywhere. Nicer for us and nicer for our gardens. The lack of snow can be very hard on the landscape, too. Without the snow to help insulate the plants and prevent the frost from getting deeper into the ground, things are bound to suffer. Trees and shrubs are extremely exposed to the recent bitter temperatures, harsh winter winds and storms of the wet freezing rain type that we have had a few times already this winter. If you notice storm damaged trees and shrubs there are a few things you can do at this point. With safety first and foremost, remove any loose or broken branches. You can cut away partially broken branches just enough to remove them, but do proper pruning in the spring. 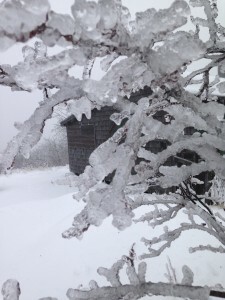 If branches are coated in ice, first take pictures because it looks really cool, then allow the ice to thaw naturally. You can cause further damage if you break or chip away at the ice. With some luck we’ll get some decent snowfall in the weeks to come. After all, it makes winter what it’s supposed to be here in the Lakes Region, right?